Your role as a health professional in disclosing the diagnosis is of paramount importance. Medical practitioners should recognise that people have the right to know what their diagnosis is. Receiving a diagnosis of dementia has an enormous impact on the person with dementia, their carers and families. Following a diagnosis, patients often report feelings of loss, anger, uncertainty and frustration, yet some people report feelings of relief to have an explanation for their symptoms. Providing a diagnosis to a person with dementia is fundamental to the principal of personal autonomy and it should be expected. Although a very small number of people may choose not to know the diagnosis (and this should be discussed during the assessment process), it is clear that the majority of people want to be informed and therefore, it is important that health professionals are honest and truthful when communicating the diagnosis to the person with dementia. Discussion of the diagnosis and its consequences may occur over time or over multiple practice visits but these results of diagnosis should occur as early as practicable. It is important that health practitioners are clear and respectful when communicating a diagnosis to the person with dementia and families and carers. The conversation should occur within the context of the wishes of the person with dementia (in a patient-centred approach), their relationship with the medical practitioner providing the diagnosis and the primary purpose for their consultation. The diagnosis of dementia should never be provided without earlier discussions about memory and thinking difficulties. Medical practitioners should discuss the possibility of dementia as a diagnosis during the process of assessment (which may take three to six months to achieve proper assessment). Provide information about dementia in a clear manner and ensure to highlight that progression is often slow, symptomatic treatments are available and that research is striving to find cures and better treatments. Be aware of your patients with a medical history of depression and/or self-harm. This news may prove to be particularly challenging especially following the first few months of the diagnosis. Counselling should be offered in these cases as an additional form of support. Be aware of the particular issues in communicating a diagnosis to patients from culturally and linguistically diverse (CALD) background. The term dementia may be interpreted as offensive and disrespectful in some cultures. 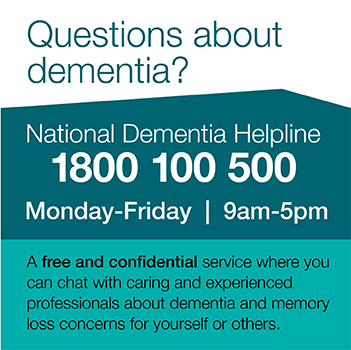 You can refer patients and their families to Dementia Australia for advice, support and counselling.